Need advice on 455 build! I bought what turns out to be a pretty built 455 that I want to drop in my '68 442. Motor was built for drag racing and had 11 passes on it. I was hoping to make it more streetable by putting in a milder roller cam (already has the Harland sharp roller rocker setup). I worked with Mark (CutlassEFI) to select the custom ground cam and such and he was a gem to work with. Problem I'm starting to realize I have is that 11.5 - 1 compression cast iron heads will require much higher octane fuel than is readily available in Colorado Springs. I'm at about 7000' and my understanding is 11.5 compression is more like 10.5 up here. Before the motor is put back together and taken to the local dyno/tuning shop I need to know what my plan is for fuel. Pump gas is only 91 around here and I've seen options including dumping loads of octane booster in 91, to using E85 (blend or straight), or biting the bullet and putting aluminum heads on. To be honest I don't even know what octane fuel I need to use at a minimum but based on the compression ratio and the fact this motor will see WOT a lot, I assume I will need upwards of 100 Octane. Only place I can get the $9/gallon 100 octane fuel is quite a drive for me and I'm not sure it's worth the hassle or expense. Would love your input as I'm starting to lose sleep over this one. You have Kum and Go gas stations all around you in Colorado springs, not like it is hard to get. Every one of these stations has E85 for cheap and it is pretty good stuff from what friends have said and others who run hot Oldsmobiles say. You can just step the cam down as planned and keep the high compression and buy your fuel for $2.20 a gallon..... for ~105 octane. Buy a good E85 carburetor and install some Earl's Vapor guard fuel lines and run an electric fuel pump that is Ethanol safe and enjoy that 11.5:1 Compression! With E85 only running $2.20 a gallon vs. $9 a gallon, you can quickly pay for all the upgrades to run it instead of buying super expensive race gas all the time, which means you won't drive the car much if it takes $180 to fill the tank with 100 octane vs. $40 a tank for E85. Thanks Battenrunner. I will definitely look into the e85 route. Do you know if I can keep my current tank and lines with e85? I know I would need a pump and carb for sure. I looked at the mechanical Rob MC pump , but it doesn’t look to be E85 capable. I know that tanks Inc has a nice tank that is deeper than stock, and it is made to hold a fuel pump inside. They are nice people and knowledgeable. i would give them a call and ask which of their fuel pumps will work reliably with E85 and run a low pressure bypass fuel regulator on a loop to allow excess fuel to return to the tank. Because you are feeding pressurized fuel through the lines, you will need to remove any plain rubber sections and replace with Earls Vapor guard as well as making a flared end on the tubing to allow an AN fitting on it. You can probably flow enough E85 with a 3/8 steel line and -6 AN fittings. You will need a return line back to the tank from the bypass regulator as well. You will probably want a 5/16 return line or larger. There are several builders of Holley double pump carbs that are built specifically for use with E85. Since your engine combo should be pretty hot, and you are going to install a higher stall converter, don’t mess with a Holley vacuum secondary carb in my opinion. Look up Mark Sullens for an E85 carb... One of the best in the business.. He should be able to help you out. He can likely convert your current carb. He has done two Holley DP's for me. Thanks 1arunem. I am pretty much sold on e85 right now based on my situation. I do have easy access to e85 in my area. I'm going to pay either way to make this project come together so I might as well be able to buy cheap fuel when it's over. I was thinking of getting a Quick fuel e85 based on a few conversations, but after your thread wonder if I should consider converting my Holley 850 DP, or just having an e85 carb from the start. Would love to hear your experience with e85, and the carburetor/fuel system situation as well. I've got everything spec'd out at TanksInc.com, and need to make a carburetor decision asap. Appreciate your input. I would find it hard to believe you can't run pump 91 octane @ 6000 plus feet, with a 23.50 baro, especially with the cam that was selected. A simple cranking compression test will tell you what you need to know, if its over 150 I would be very surprised. All 8 cylinders were compression tested at 210 psi at 6500’. I and several buddies run E85. The car I run it on is a drag only car. However a few friends use it in their street/strip cars. The ONLY changes I made were getting rid of the fuel filter with paper media (bought one with stainless media), changed to a number 7 heat range plug and of course the carb conversion. The car has a plastic fuel cell. Mark is great to work with IF you listen to what he tells you to do. He has years of experience with E85 and builds them for many types of applications. E85 is more finicky, more sensitive to temp, etc. If you run your car regularly, you should have no real issues. Letting it sit with fuel in it for long periods of time can cause issues. I have been running it for a few years with no real issues other than one time. I usually run the car out of fuel (turn fuel pump off) whenever I put it up for a while. However one time I let the car sit for months without being run and hadn't run it out of fuel. I had to take the carb apart and clean it. It will develop a chalky or even jelly like residue in the bowls if left too long . I much rather pay $2.50 a gallon then $10 a gallon for 110. I also run Lucas Ethanol treatment with every jug. 1arunem it sounds like you are pretty satisfied overall with e85 even with the idiosyncrasies of the fuel. Should have parts delivered and motor put back together in the next week or so and I'd like to get the motor over to the dyno tuner ASAP. As such I'll need to at least have the carburetor figured out for e85 by then and can deal with the rest of the fuel system over the winter. Mark (CutlassEFI) can help me out with a Quickfuel e85 if I go that route or it sounds like Mark Sullens is a great way to go if I want to rebuild my Holley 850 DP. Any thoughts as to just using my well functioning Holley 850 and having it converted to e85 or biting the bullet with a carburetor built for e85? Not sure on cost to convert but the e85 carbs look very pricey. I see no issue using your current carb unless IT has issues.. He did have to replace the base plate on one of mine. Not sure if it has changed but last year Mark was charging $430 to convert your carb. This includes new metering blocks and other modifications necessary to convert your carb. He usually test runs each carb, however it will need to be fine tuned to your motor as his test mule can't be the same as everyone's set up. He kept me up to date on the build and even sent a video of it running on the test engine. Keep in mind LOTS of folks send them to Mark over the winter (racing off season) for conversion or freshen up so it may take a bit. I think he quoted me 2 weeks but actually ended up being 3-4. However, he kept me advised..
Good luck which ever way you go.. I have had him do a 750 for me as well as an 850 that had a 1000cfm baseplate. Last edited by 1arunem; November 13th, 2018 at 01:19 PM. Well motor is finally reassembled after full roller conversion. Custom Lunati cam spec’d by CutlassEFI brought down to 239/247 with 112 LSA to make it relatively streetable (compared to previous setup). Compression ratio is calculated at 11.15:1 so tuner is having a 750 cam Quick Fuel e85 built. I don’t know much about Quick Fuel carbs but tuner thinks they are the hot setup for tunability and performance, and they make e85 specific carbs that don’t need conversion. Will post results in a few weeks when Dyno tune is complete. Can I ask who you are referring to as the "tuner"
Vortecpro any chance you've got an extra set of Olds headers laying around I can borrow for the dyno? McCabe is pretty much just a chevy and ford guy but really seems to really know his stuff. I don't have any, you might try Battenrunner. Sorry, I don't have any headers left for a standard olds cylinder head either! Ha no worries. Didn’t realize my car had puny 1 5/8” headers so I will be ordering some 1 7/8” to go on the new motor anyways. Definitely a great idea! When is Dyno day? I hope it runs great for you! Hopefully by end of Feb. Another thing I need to figure out is where to get real E85 this time of year. After a little research I think I will get Doug’s 1 7/8” ceramic headers on order unless I see something on the forum telling me otherwise. Will check the classifieds too. Bandimere is open year round for their fuel sales. I think 9-4:30 M-F. They have pure E85 for around $4 a gallon. Battenrunner Thanks you just saved me running around town with my e85 tester! Sure thing, and at this time of year, you may not find better than 70% alky in the E85 at the normal gas pumps because of winter time mixture ratios. This may mean as low as 104-105 octane. The fuel from bandimere is pure and will be closer to 110-112 octane. Motor is finally going to tuner this week and I need to come up with real E85 for the dyno. All the local stations are winter blend now so Per Battenrunner suggestion drove up to Bandimere Speedway to purchase E85. I was told they use 110 octane Sunoco for the 15% gas component, which I highly doubt the local gas stations use that sell E85 for $1.79/Gallon. I ended up getting E98 and will mix in the 15% gasoline once I know what I should use. Does anyone know what octane gasoline is typically used in E85 in the gas station stuff? Were they out of the E85 during the winter? 113 octane ethanol is typically only mixed with an 85 octane gasoline stock to make E85 fuel. I would mix it with 91 if it was mine and I had to mix it, but I certainly wouldn’t mind some hot Sunoco mixed in! Good luck with the Tuner at the Dyno! Last edited by Battenrunner; February 12th, 2019 at 06:49 PM. Finally got motor on dyno today and was not disappointed. Kept the Ga iron heads that were 11-11.5:1 and made the switch to E85. Found a used Holley 780 with vacuum secondary to run the E85. Mark @cutlessefi ordered up a milder roller cam (239/247 @ 112 LSA) to make a nice street motor with power brakes and smooth idle. The power curve is a beautiful thing with a nice flat and long torque corve. Peak numbers are 531/550 (corrected). Better than I expected and has about 12 pounds of vacuum at idle. A little bit of oil leaking from front top corners where intake meets heads so might have to reinstall intake. I might get this thing on the road this year after all. You guys did great on this one, nice work. I like the realistic power curve as well, I know this dyno to give correct numbers. Thats 11 sec HP in Colorado's ridiculously high altitude. 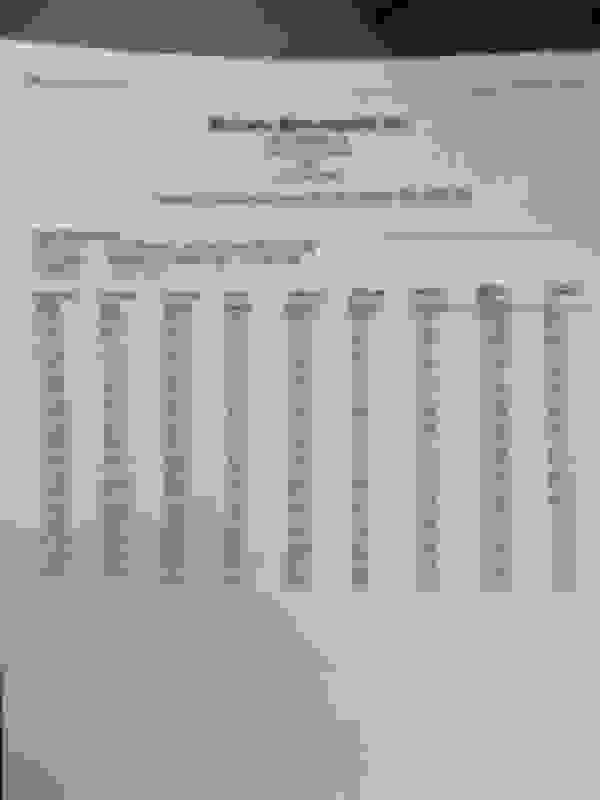 Last edited by VORTECPRO; April 5th, 2019 at 06:43 PM. Great looking Dyno John. Congrats on this build. This one seems to really have a lot wider power curve than 90% of the big block builds we see on here with aluminum heads, much less a set of Ga's! It really carries the power very well even to 6,000rpm. What was the timing set on? Now I wish you could dyno it with a good gas carb running some high octane fuel to see how much power difference there is in the E85. Looking at great torque numbers with high compression, and you are at a max VE (volumetric efficiency) of 89% at your measured RPM max torque, and 84% VE at your max HP. You are also making a measured peak of 1.195 Ft-lbs of torque (measured at 551 Ft-lbs at 3800rpm) per cubic inch (assuming it is a 461 - .030 over 455). That is a very realistic and healthy torque number for the cubes. Should be a ton of FUN man! Last edited by Battenrunner; April 5th, 2019 at 08:35 PM. Thanks Vortec and Battenrunner. Robbie McCabe was superb to deal with, but man is he busy! I'll confirm a few of the details but I believe he ran the motor first on race gas with his house carb (Holley 850?) and put down 497 hp on the test run without much messing. Who knows what he could have tweaked those numbers too. Took about 15-20 pulls with the E85 setup to get everything dialed in especially with the used carb (Holley 780) he found for me. I believe we settled on 34 degrees of total timing, might have been a little less. I'm sure the Torker intake helped up top too. I'm aware the Ga heads are smog heads and not ideal but they were ported/polished very nicely and the guy I bought the motor from was pretty proud of them so I couldn't bear to replace them with Edelbrock heads (and skip the whole E85 ordeal). I'll get over it first time I fill up the tank for $1.79 gallon though. 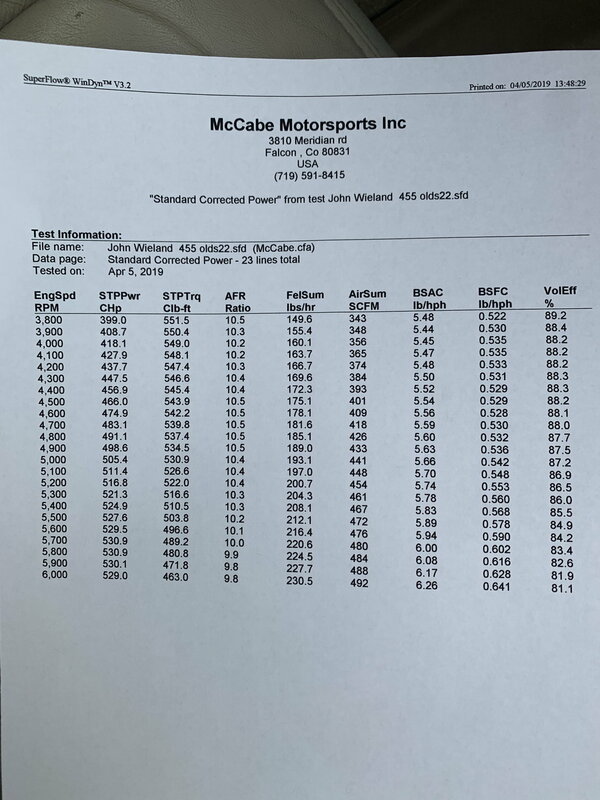 Wish I could have had a more detailed dyno printout on the lower RPMs but with the vacuum secondary it would struggle to get the secondaries to open without the torque converter. Appreciate all the input fellas, it is starting to come together. Quick Reply: Need advice on 455 build!